Lost... but not YET found! Weekend Recap & "Shopping Monday"
Once again... It's BACK TO SCHOOL!!! I found this awesome recipe on Paula Deen's website! I just ADORE her, don't y'all?!?!?! I plan to make it this afternoon! Yummy! Using an electric mixer, beat cream cheese until smooth and fluffy. Add all of the remaining ingredients and beat until well blended. We all know that school has started!!! So... whether you are an adult student or a mom of a student, you may need a "refreshment" every now and then! LOL! Here's to the new school year! CHEERS! Shake all ingredients in a cocktail shaker with ice. 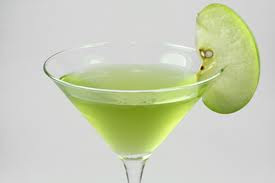 Strain into a chilled martini glass and garnish with apple slice. Enjoy! I am playing catch-up today! I started back to nursing school last Tuesday and I've been pretty busy! Mondays are my catch up day for all things... house work, homework, studying, blogging... you name it! LOL! Along with neglecting my blog, I have been REALLY neglecting my work-out routine and I'm trying to get back on the wagon! 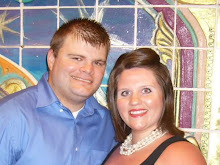 YIKES--- Our pics are right around the corner and I don't want to have 30 chins like I do right now! I have gotta get back to it ASAP!!! Anyway, since today is "Shopping Monday" and I have work-outs on the brain.... I thought I should share this with you! I have been meaning to order one of these for a LONG time! They are great for people like me that like to run/walk. It alerts you when to change pace based on time. It's great! It's called the GymBoss. 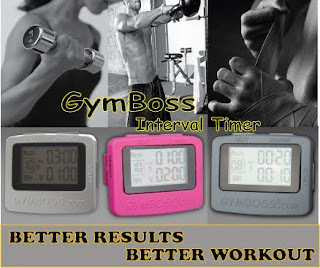 You can find it here at http://www.gymboss.com/ for only $19.99. Naturally I will be ordering the pink one! Hope everyone has a great week! I will try to keep up this week, but if not... no worries, I will catch up next Monday! God bless y'all! Today's post will definitely be short and sweet! I start back to nursing school tomorrow and I am trying to get everything in order! 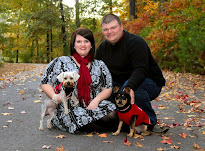 Seth and I (along with our furry babies) will be taking "family pics" for our christmas card in November. I just set the date with the photographer! I'm super-duper excited!!! My card is VERY cute this year (if I must say so myself)... I already have it picked out. I will post about it at a later date! But in the mean time... I am planning our "outfits." 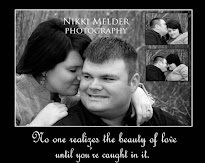 We did neutral colors last year because we did all of our pics out in a field of grass. This year we want to go to downtown historic Natchitoches. It's not anything big, but it's very quaint and has tons of opportunity for great pics! Anyway, so this year I will probably wear a dress (chocolate brown or black), bright red necklace, and VERY cute red suede pumps!!! I want Seth to wear similar colors. I will do a post later about all of the fun ideas I have.... but for now I will leave you with this eye candy! They are called "Toppazz" by Steve Madden and I LOVE THEM!!!! Because Thursday is "Thirsty Thursday", I figure Friday should be called "Foodie Friday." I will post a favorite recipe every Friday (or one that looks really yummy... because I'm not that big of a cook! LOL). This week I want to share with you a yummy dish that my father-in-law (FIL) made a few weeks back! It was AWESOME!!! But he never sent the recipe to me... so I made up my own! LOL! I made enough with this recipe that I was able to make a full 9x13 dish and then freeze an 8x8 dish for later! The frozen dish will be great on nights that I can't cook (which will be often when I start back to school... next WEEK!). I even took a pic of one of my servings!! Thanks for the "food photog" advice, Andrea! Yummy! 2. Drain all liquid from pasta. 5. Pour in a layer of pasta mixture into pan. 6. Sprinkle bread crumbs and grated parmesan on top of pasta. 7. Continue layering pasta mixture and bread crumb/cheese mixture until finished. 8. Sprinkle what's left of the cheeses and bread crumbs on top. 9. Bake at 350 degrees covered with foil 25-30 minutes. 10. Uncover the dish and bake another 10 minutes. *** Hope this isn't too confusing! I am what you call a "dump cook". I never really measure anything... just dump it in until I think it "looks good"! LOL! *** Another fun fact: Seth is a SUPER picky eater and he LOVES this! Here at "In this crazy life..." Thursdays are dedicated to cocktails!!!! I don't know about y'all but I love an awesome cocktail every now and then! Cheers to "Thirsty Thursdays." 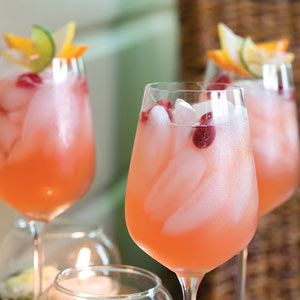 I love a crisp, cool cocktail in the summer. It's been so hot here in Louisiana lately! I think I may try this soon. It came from a 2007 Southern Living article. Stir all ingredients together and pour over ice. Garnish accordingly! ENJOY! Last semester was WILD and CRAZY! I was soooo excited about the summer because I got a little break! And boy did I enjoy that break! But now the time has come for me to start back and I'm so nervous! There are so many people in my class that have been studying ALL summer! Me--- I have been traveling and having a BLAST! Now that it's time to hit the books again I'm not ready! Everytime I get out the Dos/Calc book and work problems, I always end up getting stuck on a problem! Then I get frustrated and quit! UGH! Hopefully my sweet friend, Cole, can help me this weekend. I love him... although I haven't seen him much this summer! In other news.... hmmmm.... is there any other news besides school starting? IDK... Continue to pray for my sweet friend Andrea's granddaddy. You can also pray for all the students starting back to school! We all need it! LOL! Hope all of you are having a wonderful tuesday! Mine started out pretty good, but isn't going quite as I would have liked so far! I am nannying today and some how lost the garage door opener! I NEVER lose things! I am very particular about where I put things! I have torn my car and purse apart looking for it and NO LUCK! I'm hoping it will not cost a fortune to replace it! I feel awful! Hopefully I will find it soon! On another note... PLEASE pray for my sweet friend Andrea's granddaddy! He is going through chemotherapy as I type this! He's been pretty ill. Please pray for his strength and wellness! Good morning!!! I hope all of you had a wonderful weekend! We had a SUPER busy weekend! Seth and I are both exhausted! Low-key Friday, just hung out at home after work. Saturday was busy! I nannied most of the day... even had to leave Seth with the kids for an hour and a half to do a Les Amies service project! Having kids around is a whole different ball game than just having Seth and I! LOL! More on all of that later! My daddy came to stay the night with us Saturday night. He took us to dinner and we had a great time! We got up early Sunday morning and went to 8:30 service. It was AWESOME (more on that later)! We left church and traveled to Covington for a memorial service for a wonderful young man! 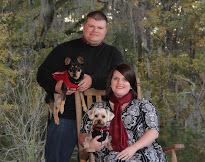 Please continue to pray for the Greene family of Covington, LA. They lost their 23 y/o son last Thursday in a tragic farming accident! So sad! I've decided since I am going to try to blog more often that Monday should be "Shopping Monday." It'll give me something to look forward to at the beginning of the week! I mean... nobody really likes Mondays, but with a little fashion thrown in, it may be a little more tolerable! 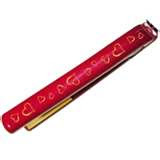 I have been shopping on-line again! As you all know, I LOVE handbags and shoes! I have a little addiction! I think it's because, unlike clothes, no matter how fat I get the purses and shoes still "fit." LOL! 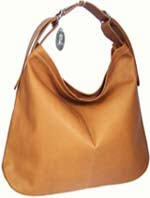 *This is a GORGEOUS handbag that I saw Bethenny Frankel carrying on her show! It's HUGE, which I love, and it's simple! I googled it to find it and actually found a forun where other women were talking about it, too! LOL! And the best part... It's under $200 (which is unheard of when I buy handbags)! SOOOOO excited about that! WooHoo! 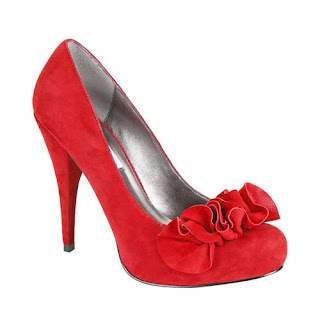 *These are absolutely the CUTEST shoes ever!!! They are a little pricey but I would LOVE to have them! Maybe next summer! 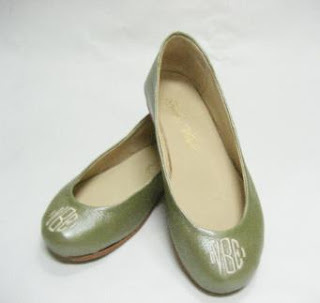 * These ballet flats are soooo stinking cute! I LOVE them! 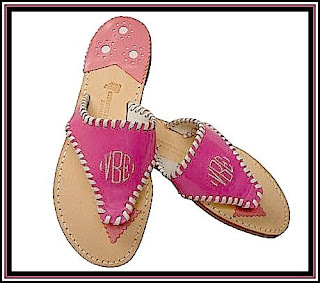 And of course... they have a cute monogram! As you all can tell (all 3 of you that read my blog).... it's been over a year since I've written anything! I am going to try my best to start blogging more regularly... school starts back on August 24th so I can't promise alot! Speaking of school... As many of you are wondering why I talk about school...Well this past November I decided to take a leap of faith and go back to school. I have gone back to pursue my degree in Nursing! I couldn't have picked a better career! I am in my second level of clinicals! My other job as an x-ray tech wasn't what I wanted to do at all! I disliked it very much! I was never happy doing it and I didn't want to be unhappy for the rest of my working life! I have until next December before I graduate! It seems like FOREVER away!!!! But it will definitely be worth it in the end! Hubby has been sooooo wonderful during this transitional time! He has been working 2 jobs so that I can focus on school! 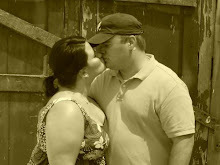 He's absolutely the best husband a girl could ask for!